You are a business owner. Your life is out-of-control, or that is how it feels at times. Some days you are connected with those you love and other days you feel so distant. Other days, you are so productive that you are amazed, while others you feel burned out because of over work. Does that sound familiar? That was my life for years. Driving hard, making things happening and trying to manage work/life balance. Get this. Work life balance is a farce. Others usually speak it to people, with the goal of getting them to work less and connect more. Again, that doesn’t work. And again, I know because I have both tried it and have been spoken to by these noble friends. Work life balance is primarily not about time. That is where most work life balance tools go wrong. They assume that if busy adults could simply manage their time then all will be well and everyone will enjoy them and vice versa. Business and life is actually more about mindset than time. For instance, I can schedule a lunch with my wife during the week because I want to feel good that I connected with her during the work day, but actually be very far away from her. My body may be at the lunch, but my mind might be very far away. The same can occur with time with kids or friends. How our mind goes, so goes our actions. Therefore, we have to master our minds in order to shift into the right gears at the right time. Time is not the issue, our mindset is. 1. Pick a marker that triggers your mind to shift from task mode to connected mode. I currently use a bridge as my marker to shift my mind into the best gear to be present with my family on the way home. The results will be more connectivity with your family with greater peace in your personal life. 2. Use time to cause you to shift into the appropriate gear. The :58’s are good triggers to cause you to shift. If you have a meeting at 3PM, then use 2:58 to shift into thinking about your next meeting and the person specifically that you are going to meet. The results will be increased influence and more productivity as well. 3. Don’t look at email before breakfast if possible. When we choose to do so we let others set our agenda for the day based on their email or request. When you choose to wait then you can appropriately recharge and be energized for the day ahead. I my new book, I take these concepts deeper by using a metaphor called the “5 Gears.” It is based on a manual stick-shift transmission, with each gear correlating to a corresponding behavior that people shift into at certain times and with certain people. Each gear has a purpose, and if you apply this driving analogy to the way you “drive” your life – aligning the right gear with the right speed and situation – it will allow for a smooth journey. The goal being to help busy adults become masters in emotional intelligence. If you have issues with being distracted or possibly with becoming overwhelmed by your work consistently, then your mind might be stuck in 4th or 5th gear. If you don’t shift appropriately then you will stay stuck in a gear that will eventually cause burnout, discontentment from loved ones and a disconnection from reality. Most adults live in that space today. Learn how to shift your mind to be in the right gear at the right time and you will experience a work life balance based that leads to you being present and productive. 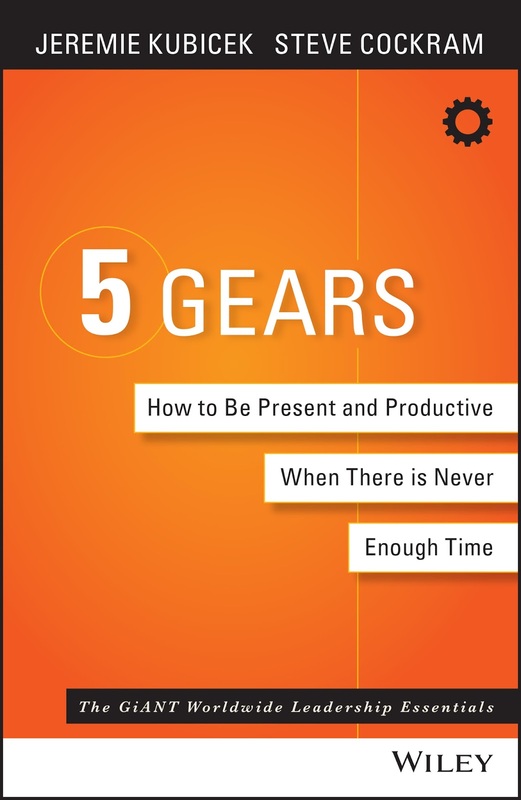 Bestselling author Jeremie Kubicek is co-author of 5 Gears: How to Be Present and Productive When There Is Never Enough Time and co-founder of GiANT Worldwide, a global company dedicated to transforming and multiplying leaders and teams. Follow him on Twitter at @jeremiekubicek. I agree we have far too many people that get trapped on a conveyer belt and pass life by not by choice but by not choosing to decide what to prioritize. I also agree work-life balance isn't a good way to look at it. I lived my Dad integrating work and life extremely well. The idea you need to block off life and work isn't true. I do understand that the way many people live they feel as though that is the only choice. And actually in some instances I think maybe it does come down to that. But you are much better off if you avoid that dichotomy and instead focus on creating the best integrated life. Yes, integrated is the goal. I agree that your mindset and thinking has a lot to do with your ability to integrate and connect the different parts of your life. There is so much science and understanding about the brain now, that it makes sense to recognize how your brain works and commit to thinking and then behaving is ways that enhance your whole life.